OUR THREE-PART video series on integrated pest management (IPM) concludes with a look at one of its five basic principles: how apple growers use a diverse combination of management tools to treat pests in their orchards that pose an economic threat, including the introduction of beneficial insects, and the use of pheromones to attract, distract, trap, or confuse would-be predators. IPM, Part 1 examines how pests are prevented and identified. IPM, Part 2 explores how New England apple growers monitor pest populations in their orchards and decide when to treat the predators threatening the apple crop. The series was produced for the nonprofit New England Apple Association, with funding from Farm Credit Northeast AgEnhancement and the New Hampshire Department of Agriculture, Markets & Food, and its Division of Pesticide Control. PLUM CURCULIO, Oblique Banded Leaf Roller, and apple aphids are the featured pests as New England apple growers describe how they monitor populations in their orchards and decide when to treat the predators threatening the apple crop. IPM, Part 3 looks at the diverse combination of management tools growers use to combat pests, including the use of pheromones, beneficial insects, and weather monitoring. The series was produced for the New England Apple Association, with funding from Farm Credit Northeast AgEnhancement and the New Hampshire Department of Agriculture, Markets & Food, and its Division of Pesticide Control. FOR AS LONG as humans have cultivated the soil to grow the food that sustains them, a whole horde of beasts, bugs, and bacteria have attempted to partake of the bounty. For the modern fruit grower, the challenge of protecting their trees and fruit from predators and injury has been compounded by the introduction of new pests introduced to New England’s orchards from around the world. Growers have powerful incentives to use as few chemicals in the orchard as possible. They are expensive to purchase and apply. In New England, most farmers and their families live on the farm. Growing apples is hard work, a round-the-clock job requiring devotion to the land. Apple growers are part scientists, part environmentalists, who take immense pride in growing beautiful, delicious fruit and maintaining healthy orchard ecosystems. There are many safeguards to guarantee the safety of the apples we eat. The heaviest pest pressures occur in the spring and early summer, beginning before the fruit is even formed, and often months before it is picked. Growers must follow the Environmental Protection Agency’s “pre-harvest intervals,” prescribed periods between the time the trees are sprayed and when it is safe to pick the fruit. Upon entering the packing house, the apples are floated in a long water bath before brushing and sorting begins. Consumers should always wash their fresh produce as a safeguard against mishandling between the time it leaves the farm and when it is purchased. Growers will continue to be vigilant in seeking effective, non-chemical treatments to combat the threats to their orchards. Consumers can help by being more accepting of minor blemishes to their fruit, the harmless patch of apple scab, the occasional spot or nick that typically keeps otherwise perfectly healthy fruit from the marketplace. But as you will see from “Apple Growers Battle Pests with IPM,” our three-part video series, nearly every farmer is invested in producing healthy fruit in sustainable ways. The three IPM programs are posted on the New England Apple Association website, newenglandapples.org, and on YouTube. Please forward the links to anyone who is interested in this important and fascinating topic. Russell Steven Powell produced and directed the programs for the nonprofit New England Apple Association, and Associate Producer Bar Lois Weeks wrote the script. John Browne videographed, edited, and narrated the programs. Special thanks to John Rogers, Pete Rogers, and Greg Parzych of Rogers Orchards in Southington, Connecticut, Chuck Souther of Apple Hill Farm in Concord, New Hampshire, and IPM Field Scout Brian Farmer of Apple Leaf LLC, for sharing their knowledge and experiences. The series was funded with grants from Farm Credit Northeast AgEnhancement and the New Hampshire Department of Agriculture, Markets & Food, and its Division of Pesticide Control. APPLES ARE SO AGREEABLE. Invite them to breakfast, lunch, or dinner and they will feel quite at home. It doesn’t matter where you place them — they get along equally well with peanut butter, pears, and pork chops. Apples make everything around them taste better. Take apples for a walk, bring them in the car, put them in a lunchbox. They thrive wherever you put them, in whatever company. Bubbe’s Apple Cake is bursting with apple-cinnamon flavor, but the slices are coated with plum jam and almond extract. It keeps well for several days but is best eaten fresh, so it makes an ideal dessert when friends are coming over. 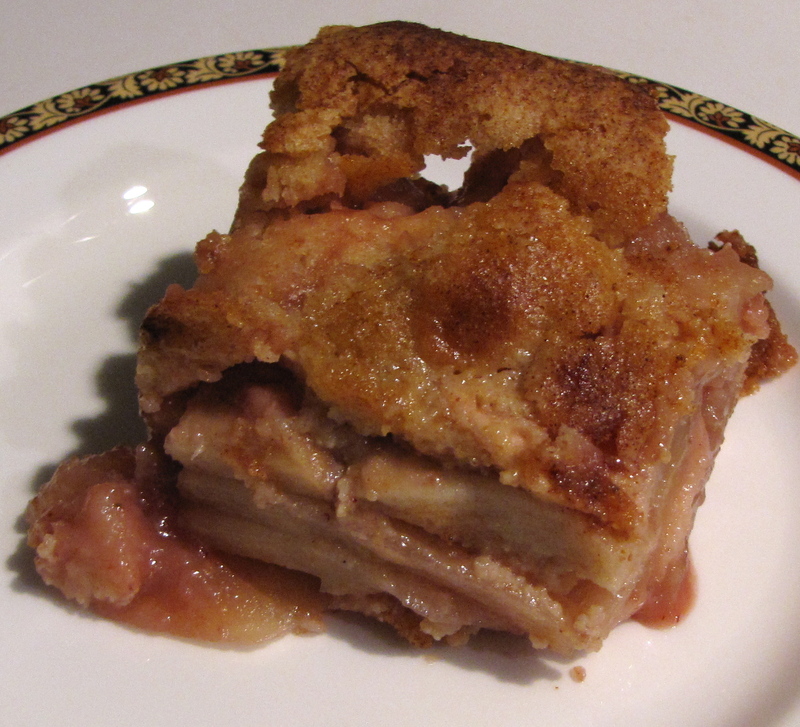 Or if it’s just you, Bubbe’s Apple cake is a relatively wholesome way to satisfy that sweet tooth. We’ve seen various versions of Bubbe’s Apple Cake online and over the years; for our version we used some whole-wheat flour and punched up the apple flavor even more! We made this with two McIntosh and two Honeycrisp apples, creating a superb taste and texture. You can use any New England-grown apples. Preheat oven to 350°. Grease and flour an 8”-square baking dish. Combine flours, baking powder and salt in mixing bowl, and set aside. Place apple slices in large bowl. Add jam and lemon juice and stir until slices are coated. Beat eggs well. Gradually add sugar and beat until mixture is almost fluffy. Stir in flour mixture. Add oil and extracts, and continue to stir until batter is well blended. Spread half of batter evenly in prepared baking dish. Cover with apple-jam mixture. Spoon remaining batter on top. Sprinkle lightly with cinnamon. Bake for about one hour, until top is golden brown. GROWING FRUIT in a humid climate is much more difficult than it is in an irrigated desert. Frequent precipitation creates a fertile environment for agricultural pests, so New England’s apple farmers have to deal with a number of diseases and insects. Scab, a fungal disease, is the major pest problem in the Northeast. In addition to scab, New England apple orchards can be damaged by sooty blotch/flyspeck, plum curculio, apple maggot, or fruit moths. The disease fire blight can be devastating in some years, and mite management is an ongoing concern. Insects like sawfly and leaf-rollers cannot be ignored. Weeds, rodents, deer, or fungal fruit rot can cause problems. The process begins with farmers reviewing when and where pest problems arose the previous year. IPM growers have either a weather station on the farm or subscribe to a web-based service for detailed information. This data is fed into models that forecast risk. Traps are placed in the orchard to monitor insects, and growers check them and inspect trees for damage at least weekly to determine risks from these pests. IPM growers use flail mowers early in the season to destroy old leaves and twigs that can harbor diseases. In late winter, they prune out dead or diseased wood. During the summer, they mow grass to decrease humidity, thereby decreasing the risk of pests. IPM is a constant process of knowing which pests present a significant risk at any given time, and determining the best management tool to use at that time, says Dan Cooley, a professor of microbiology at the University of Massachusetts, Amherst. He has been working on IPM issues since 1979, when he was studying for his Ph.D. in plant pathology. When risk is high, growers select a treatment method, usually some form of spray. In IPM orchards, growers select pesticides that have the least impact on the environment, though they are generally more expensive than older ones. IPM management tools tend to be more expensive as they become more sophisticated. Matching detailed weather monitoring with disease prediction models, for example, is more expensive and complicated than simply watching a weather forecast. Growers often must hire consultants to monitor and analyze their orchards’ pests. Over time, some pests, such as the tarnished plant bug, have become much less of a problem for apple growers, says Cooley, but new ones, like the brown marmorated stink bug, have emerged. Growers and scientists must constantly adjust IPM systems to correspond to an orchard’s evolving environment. Existing pests gradually learn to adapt to new management tools, too. One of the most difficult aspects of IPM, says Cooley, is developing tactics that maintain effective control without over-stimulating the pest’s drive to defeat it. THE IPM APPROACH can be applied to non-agricultural settings such as the home, garden, and workplace. Tina Smith, greenhouse crops and floriculture specialist for the University of Massachusetts, Amherst, Extension, will give a presentation on, “Good bugs, bad bugs”: Integrated Pest Management (IPM) for home landscapes and gardens, Tuesday, March 22, at 7 p.m. Smith Academy Cafeteria, 34 School Street, Hatfield, Massachusetts. The event, sponsored by the Hatfield Agricultural Advisory Committee, is free and open to the public. Light refreshments will be served. 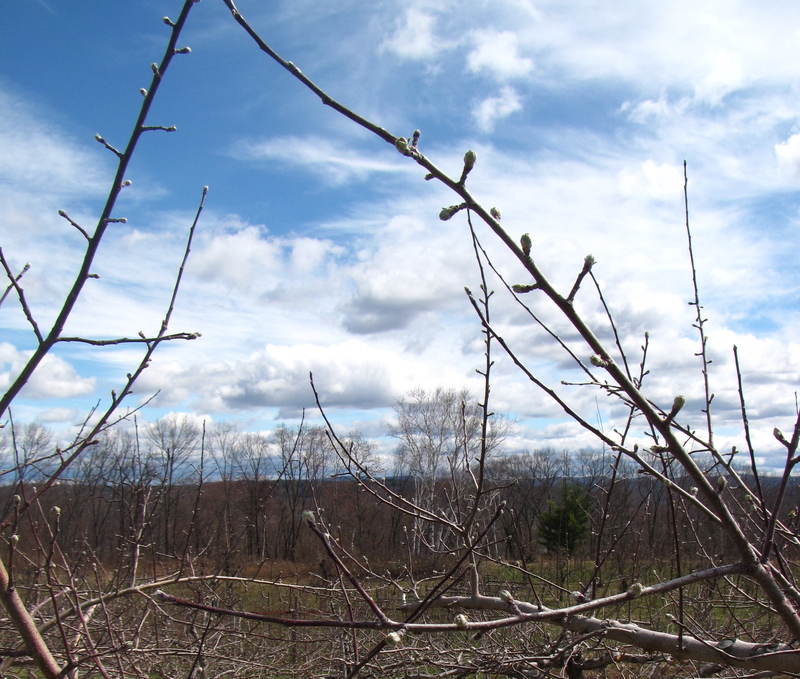 THIS IS THE SEASON for pruning in New England’s apple orchards. To learn more about how it is done, view this video, the first of a two-part series on pruning. For more information about New England apples, visit http://www.newenglandapples.org.